Today's Black Friday Style wardrobe inspiration has a sporty, casual approach with a chic finish. This look could easily be paired with sneakers as well for a cool day look. However the heels makes it a chic for a laid back evening out. 1. STELLA MCCARTNEY ruffle-trimmed cotton-blend sweatshirt, available at MATCHES FASHION. 2. 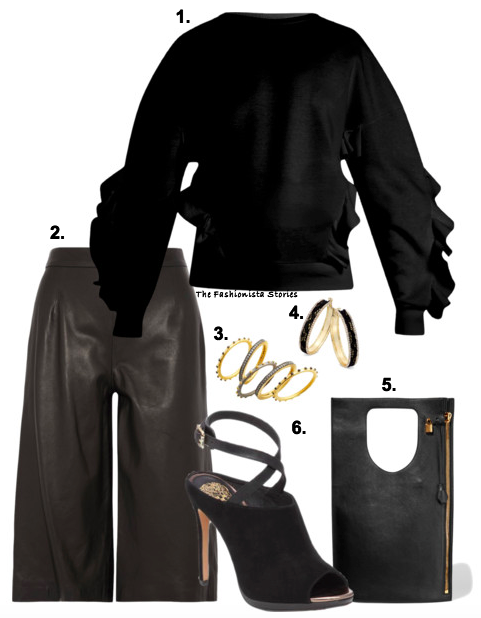 IRIS & INK leather culottes, on sale at THE OUTNET. FREIDA ROTHMAN contemporary deco stacking rings, available at NORDSTROM. 4. THALIA SODI gold-tone metal mesh & crystal hoop earrings, available at MACY'S. 5. TOM FORD 'Alix' medium textured-leather tote, available at NET-A-PORTER. 6. VINCE CAMUTO 'Resina heels, on sale at 6PM.